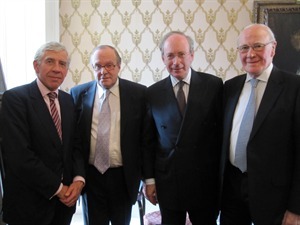 The Rt Hon Sir Menzies Campbell MP, the Rt Hon Sir Malcolm Rikfind QC MP and the Rt Hon Jack Straw MP reviewed the Coalition Government’s foreign policy in a debate chaired by Lord Lothian, GSF’s Chairman on 7th June 2011. There was standing room only at the National Liberal Club when former Foreign Secretaries Sir Malcolm Rifkind MP and Jack Straw MP and former Shadow Foreign Secretaries Sir Menzies Campbell and Lord Lothian took part in a debate entitled ‘One Year On: Is the Coalition Government’s Foreign Policy “Clear, Focused and Effective?”‘, which drew on a quote by William Hague in his first major speech as Foreign Secretary, in which he set out the broad principles underpinning what he described as a ‘new approach for British foreign policy. Perhaps surprisingly, there was much consensus amongst the panellists and an agreement that foreign policy should, to a large extent, be bipartisan. There was some disagreement over the extent to which the Coalition had achieved a coherent overarching framework within which British foreign policy was formulated and discharged. Questions were asked on the Arab Spring, Libya, the Commonwealth, arms sales and the priority which the FCO should accord the promotion of British trade. Click here to listen to The June Debate I.